The Pierre is a breathtaking home tucked away in the cluster of rocks it was named after ("Pierre" means "Stone" in French). Olson Kundig Architects designed the hideaway for the owner, who was inspired by the lovely views from the property of the archipelago of the San Juan Islands. The bunker-like villa was built using largely local materials, and its green roof and rocky color cause it to melt away into its peaceful surroundings. 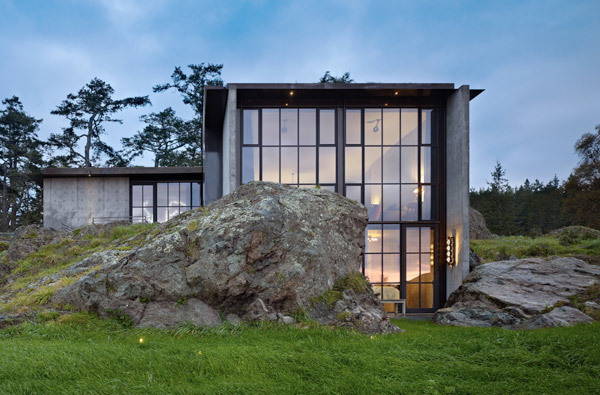 Since architect Tom Kundig designed the house to be sunken into the site, some of the existing rock had to be cut away. While the excavation process wasn’t an easy one, it came with an extra bonus for the contractors – the chipped away stone could be re-used as aggregate to be mixed into the concrete flooring. Unlike in most inset structures where walls are put up and the surrounding material is never seen, the natural stone makes appearances throughout the house, adding, not subtracting from its aesthetic appeal. The fireplace hearths were carved from the existing rock and left raw as a striking contrast to the otherwise very polished accouterments. 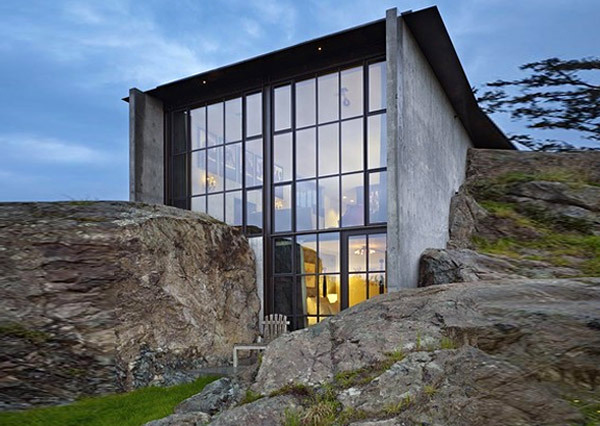 Many of the other eye-catching features of the home are made of the rock as well. The master bathroom’s sink is composed of water cascading into three pools of the existing stone, and a powder room off of the main space is fully carved out of rock. Can the world only be saved by very rich people's houses & expensive clothing? Since architect Tom Kundig designed the house to be sunken into the site, some of the existing rock had to be cut away. While the excavation process wasn't an easy one, it came with an extra bonus for the contractors - the chipped away stone could be re-used as aggregate to be mixed into the concrete flooring. Unlike in most inset structures where walls are put up and the surrounding material is never seen, the natural stone makes appearances throughout the house, adding, not subtracting from its aesthetic appeal. The fireplace hearths were carved from the existing rock and left raw as a striking contrast to the otherwise very polished accouterments. Many of the other eye-catching features of the home are made of the rock as well. The master bathroom’s sink is composed of water cascading into three pools of the existing stone, and a powder room off of the main space is fully carved out of rock. An old bookcase adds to the home's rustic feel. A view of the Pierre's peaceful grass roof.